C. R. Ashbee was a man of immense talents and energy and a defining figure in the Arts and Crafts Movement. In 1888 he founded the Guild of Handicraft in the East End of London with the intention of reviving traditional craft skills and providing satisfying employment in a deprived area of the city. Trained originally as an architect, he is known also for his highly innovative furniture, metalwork, silver and jewellery designs. This brooch was originally a pendant, attached with many others to a necklace also made by the Guild of Handicraft. Its ship motif was a favourite of Ashbee's, often appearing on Guild of Handicraft work. 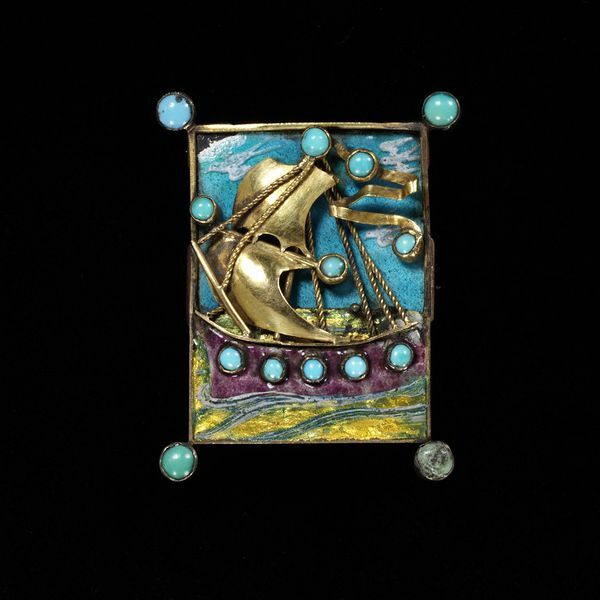 The ship was also popular amongst other Arts and Crafts designers in Britain, American and Scandinavia.